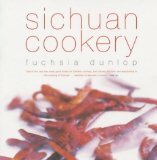 On its publication in 2001, Sichuan Cookery (published in the United States as Land of Plenty) was immediately acclaimed as a classic. For the first time in the English language, it brought together authentic recipes gathered in the kitchens of Sichuan with a wealth of anecdotes and colourful descriptions of Sichuanese life. The book includes detailed information on kitchen techniques, and many irresistible recipes such as fish-fragrant aubergines (the author’s favourite), Gong Bao chicken, Pock-marked old woman’s beancurd (mapo doufu) and twice-cooked pork.